CPAHero.com Affiliate Marketing Sources & Inspirations You Earned It : Payment Proofs Going great at eBay! This is some good start for a newbie, isn't it? 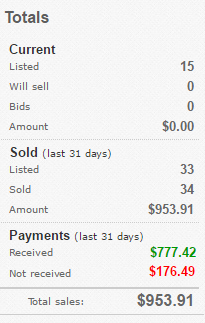 Any tips how to boost my listings? UPDATE: Calculated it. 150 bucks starting from 12 January. What is it that you're selling? Do you hold an inventory of items? He hasn't posted here in almost a year, but you can try sending him an email through the contact info in his profile.